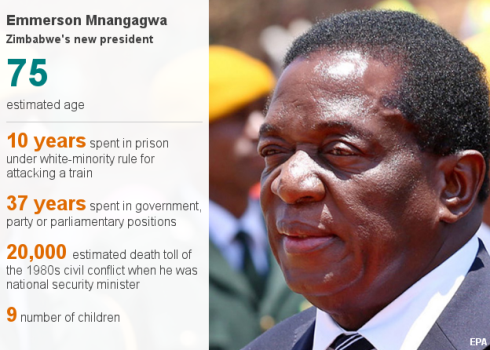 Zimbabwe’s new President Emmerson Mnangagwa has pledged to re-engage the country with the world, following the dramatic departure of Robert Mugabe. In his inauguration speech, Mr Mnangagwa sought to reassure foreign investors to attract badly needed funds to revive Zimbabwe’s failing economy. And he also praised Mr Mugabe, calling him Zimbabwe’s “founding father”. Mr Mnangagwa’s dismissal as vice-president earlier this month led the ruling party and the army to intervene. Mr Mugabe – who had wanted Grace Mugabe, the then-first lady, to take up the presidency – was forced to announce his resignation on Tuesday, ending 37 years of authoritarian rule.